All Days Music Inc.(ADM), was started on the principal that entry level or student grade musical instruments should be of playable and enjoyable quality to insure the success and enjoyment of the individual pursuing an instrument. This ADM VLP11 series violin,with handcrafted solid spruce top and solid maple neck, back and sides, to strengthen the stability of bodys and offers excellent acoustical properties and good response. Manual sidewipe made good tune quality, finishied painting body and back not only beautify the product but also make it dust-proof.India pegs are not easy skidding, easy on turning strings. All these exquisite technologies give you a comfortable feel when you play the voilin. 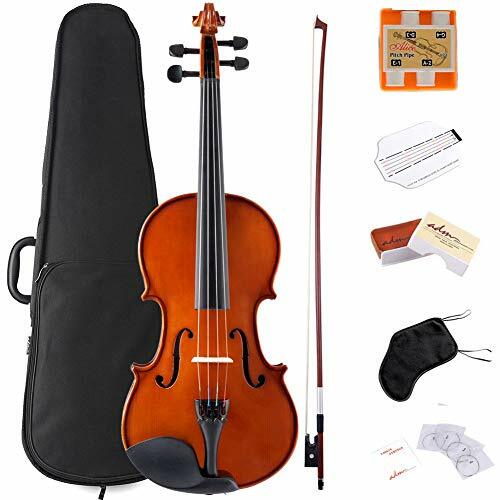 All elementary accessories are including to start your music lesson: lightweight case, Brazilwood bow, pitch pipe, extra violin strings, rosin, chinrest pad, fingerboard sticker. Save yourself time and money with an all-in-one violin package!